A big welcome to all the children to Year 3 and Room 33. The students have settled quickly into new routines. As a homework task the students were asked to complete an "All about me" sheet. I was amazed at the quality of work that came back. 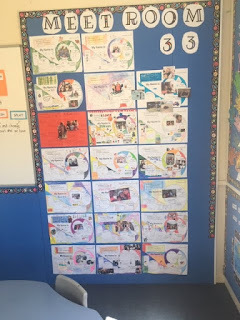 The students have shared their work with the class and it is now collated on our classroom wall. Today we visited Gym Kids and had lots of fun learning how to do forward rolls and handstands. We got to have a go on some of the equipment like the trampolines, ropes and foam pit. We are looking forward to visiting again in a couple of weeks. A big thank you to our parent helpers that came along. Today Room 33 went outside into the sunshine to play with bubbles. There were bubbles everywhere. We used this experience as a basis for our recount Writing. The students used adjectives, onomatopoeia and the five senses in their Writing to describe the bubble experience. Every Wednesday morning in Term 4, Room 33 are lucky enough to have Miss Youn come in and teach us all some Korean words, greetings and songs. We are going to be learning how to write some Korean words in the next few weeks. 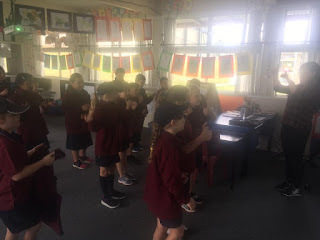 We had so much fun creating our Maori Pa's. The students worked really well together in their groups and had lots of fun taking ownership of their own learning. There was lots of team work, problem solving, thinking and communication skills happening in all of the groups. Last week for Inquiry we made Poi’s. We were lucky enough to have some students from FLS help us with the plaiting. This week we have started practicing a Poi routine called E Rere Taku Poi. We have been having lots of fun learning this routine.